This is the time of year when farmers in Idaho are planting their crops. Common crops include potatoes, barley, wheat, and alfalfa. Thanks to the federal government, affordable crop insurance is available to farmers and ranchers on most crops. There are two types of crop insurance available to farmers: Multiple Peril Crop Insurance (“Multi-Peril”) and Crop-Hail Insurance. Multi-Peril Insurance must be purchased prior to planting. It covers the loss of crop yields from all types of natural causes such as drought, excessive moisture, freezing, and disease. Coverage may also include protection against changes in market prices. Multi-Peril Insurance is offered under a unique public-private partnership between private insurance companies and the United States Department of Agriculture Risk Management Agency (“RMA”). The RMA sets the rates that can be charged and determines which crops can be insured in different parts of the country. Private insurance companies are required to sell insurance to every farmer who requests it. Risk is shared between the RMA and the private insurance companies. The federal government subsidizes farmer-paid premiums to reduce the cost to farmers. Through this federal support, crop insurance remains affordable to a majority of Idaho’s farmers and ranchers. Crop-Hail policies are not part of the federal crop insurance program and are provided directly to farmers by private insurance companies. Many farmers purchase Crop-Hail coverage to deal with the risk of Idaho thunderstorms. Hail has the unique ability to totally destroy part of a field while leaving the rest undamaged. Unlike Multi-Peril policies, a Crop-Hail policy can be purchased at any time during the growing season. In addition, a Crop-Hail policy will often protect a crop (like barley) against fire, lightning, and windstorms. Grain crops are especially susceptible to loss from fire just before harvest, and a Crop-Hail policy may provide protection. Idaho farmers and ranchers are used to taking risks. However, crop insurance can affordably assist farmers and ranchers in minimizing the financial impact of those risks. 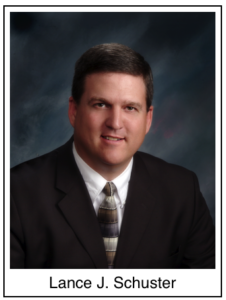 Lance J. Schuster is a lawyer at Beard St. Clair Gaffney. He and his wife raise kids and cattle on their small farm near Idaho Falls. He can be reached at 523-5171 or lance@beardstclair.com.